Behind every great product are creative minds that come together to develop something that is truly unique. In 2008, Zack and Gary met one another thanks to a synergy in their professional lives. Aside from both being business owners and entrepreneurs, Gary and Zack quickly discovered they had a great deal in common and shared similar interests. Their wives share the same name, and their daughters share the same middle name among many other similarities in their lives. By 2010 they had a solid professional relationship. 2010 is also when Zack discovered ecigarettes. Having smoked 1 to 2 packs a day for over 15 years he was ready for an alternative. Sampling the eliquids led him to investigate creating his own liquids. After a great deal of trial and error he hit on some fantastic blends that he continued to perfect, and shared them with Gary. Being one to enjoy cigars, Gary was keen on trying something new and was instantly hooked on the quality of the eliquid Zack produced compared to other liquids they had both tried. They both believed that the market lacked a quality product like this and was overrun with lesser-quality eliquids. Other Vapers needed to try this. They firmly believed their product was superior in quality to many other eliquids, and Gary was behind Zack 100%, helping him continue to perfect his flavors and research new eliquids. Every product needs a name if you are going to market it. Like their uniqueness of their products, they sought a brand representation that was unique. Something that avoided the common clich's in the ejuice market. They turned inward to examine not just the product, but themselves, their passions, their interests. Gary is 6'6", 350lb. lover of the outdoors. Zack is shorter in stature but has a commanding, confident presence with a passion for high performance motorcycle racing. Zack also has just one functioning eye. 1 Giant. 1 Eye. Strength. Remarkable Skill. Intense Passion. 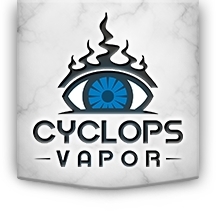 There was no better representation of their approach to crafting high quality eliquid than the Cyclops. A one eyed giant who crafted the perfect weapon for Zeus on Olympus. It is a symbolic mixture of everything they bring to the product personally and professionally. While others focus on churning out a variety of flavors in order to attract the widest audience for the purpose of profit, we focus on the quality of the product itself. That is why we limit our flavor offering and why our brand presence is steeped in Greek Mythology. There is not an infinite number of Gods. Each Deity is unique, bringing something remarkable to the pantheon. We see our liquids the same way. Each should be perfect. A stunning flavor combination that is unique. We'll spend months painstakingly perfecting each eliquid flavor before even hinting that it's being researched and developed. Even after this process, we may not bring it to market. We have discarded more flavors than we've accepted, even after months of work, because we believe that our customers deserve only the best. Siren – The Siren has lured many a sailor with her sweet seductive song. Much the same way so few can resist the aroma and flavor of a freshly baked, moist pineapple upside-down cake. 65/35 VG/PG blend. Gryphon – King of beasts... a powerful and majestic creature. It's only fitting that it represents one of the most favored and enjoyed breakfast pastries; a sweet, creamy Danish layered with the flavor of fresh blueberry. 65/35 VG/PG blend. Like an arrow from the curved bow of the Goddess of the Hunt, Artemis is a berry cobbler flavored ejuice with a delicious baked flavor that pierces your taste buds. It’s delicate blend of subtle berry hints mingled with the baked crust traditional to cobblers, mixed together in the perfect 65/35 VG/PG blend with a color that of liquid gold. She is the overwhelming and fearsome presence within untamed lands where men discover their mortality; the hills tremble in her wake while she deals death with arrows crafted by the Cyclops. Experience the Majesty of the Mistress of Animals. Inspired by Athena the Goddess of Wisdom, Crafts, and War – Our Athena eliquid is a delicious blend of sweet and sour apples in a 65/35 VG/PG formula. This thin, delicately amber eliquid has a very subtle flavor on inhalation with a lingering aftertaste that intertwines the sweetness of a red apple with the tartness of a green apple, producing an aroma you won’t soon forget. The subtle flavor and light but lingering punch of green apple pays homage to Athena, a calm but spiteful goddess who carried sweet words backed by the sharp point of her spear. When the god Zeus had in mind the making of a world through a word, his first thought was Athena. She was born from the head of Zeus, leaping forth fully clad in armor as if prepared for battle. Setting her crisp green eyes upon the world before her she pealed to the broad sky her clarion cry of war – and Olympus trembled. It is said that Athena would give the gift of a crisp green apple, a signal of immortality, to those she favored. A gift bestowed to only a select few of her most devout followers. Our Colossus premium eLiquid is a smooth sweet flavor based on vanilla custard. The subtle flavor combinations we use in our 65/35 VG/PG formula result in a satisfying pull with a great taste on exhale without being overbearing. It’s just the right intensity. How could such a simple eliquid offer the intense decadence of a favored dessert? A similar question could be asked of the mythological Colossus for which it’s named. According to Greek Mythology, the Colossus of Rhodes was a giant Greek statue created in the image of Helios, the god of the sun. The statue was located on the island of Rhodes and was considered to be one of the seven wonders of the world. The statue stood over 100 feet tall, and it remained until it was destroyed by an earthquake in 226 B.C.E. Many tales, from ancient to modern (including an appearance and epic battle with Kratos in the game God of War II), tell of the Colossus springing to life. Legends speak of the Colossus destroying armies, smashing entire fleets of war ships, and acting as a destructive weapon by those who would control it. Others speak of the Colossus acting as a guardian, utterly destroying those who harm the mortals it protects. What stands more true: Defending sweet giant or intense weapon of chaos? Our Poseidon premium eLiquid provides vapers with a crisp, delicious flavor combination, pulling together elements from some of the worlds most succulent fruit and melon varieties. This 65/35 VG/PG blend pulls together delicate hints of fruits and melons, offering a satisfying decadence akin to the sea when it as at its calmest. The boldness of the formula, with its lingering flavors on exhale strikes you with a fantastic pull like the most turbulent seas. It is truly the embodiment of Poseidon – the God of the sea – for which this eJuice was named.